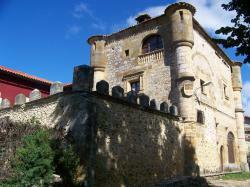 Placed in a group of historical building from S XVI-XVIII introduced by Decreto ante la Protecci�n de Castillos de Espa�a, places where venue nobles and King where highlight Carlos V, it is located La Posada Torre-Palacios de los Alvarado. Accomodations with very good location in the center of a building with a terrace, garde, golf court, parking and a meeting room for the clients and access for reduce mobility people. .living room in some of them. It is an accomodation with a good quality-price relation. Built in 1531, renovated in 2007. 22 beds, 10 rooms, 4 floors.